It’s a horseperson’s worst nightmare. Just hearing the word “colic” makes many of us cringe because it can mean so many things. Perhaps you’ve had a horse colic in the past and they came out of it just fine in a day or two with no lasting affects…or maybe it was a more serious condition that required surgical intervention for the horse’s survival. And even worse, having to make that heartbreaking decision to put your horse down if nothing else can be done and you can’t afford the expensive surgery. It was a decision I had to make on the morning of April 12th, 2011. Although we all know that someday our horses will pass on to greener pastures, we always think it’ll be many years from now when the horse is old and gray and has lived a long, happy life. Unfortunately, sudden and unexpected injuries or illnesses force us to make tough decisions in a very short amount of time and destroy those romantic dreams of growing old with your beloved horse, or having your children enjoy them as you did. I’ve been fortunate that I’ve owned horses that have been relatively healthy all their lives. I owned my Palomino Quarter Horse, Sunny, since he was a yearling and he passed away at the nice old age of 32 a couple years ago, and he was still showing and giving lessons just a few years before that. My horses have generally led uneventful lives now that I wasn’t showing anymore. They got lots of treats, went on the occasional trail ride, and although they were older horses (mid to late teens) they were in good health (albeit my Morgan is really fat), and I didn’t expect anything major to go wrong with any of them. However, my Appendix QH, Slew’s Silver Dancer (aka “Cole”), a great grandson of the 1977 triple crown winner Seattle Slew, changed all that. I bought Cole to use as a lesson horse six years ago (back when I was giving lessons). Sunny was getting too old to do lessons and I needed a younger but beginner-friendly replacement. He was well trained, kind, great with kids, could go english or western, and was a nice show horse. He was light gray with darker gray points, and although he was a QH/TB cross, he would almost prance when he trotted which made him stick out in the show ring. When the vet arrived, she took his vitals again, did a rectal exam, tubed him to put some water and lubricants in his stomach to try to help flush his system, gave a shot of Bantamine, and we watched him for a little while. He seemed to feel a little better, was a bit perkier, and he wanted to eat a little bit, so we left him in his stall for the remainder of the night and I came out and checked on him every couple hours. We both anticipated he would come through it ok. The next morning was another story. He had pawed at his stall most of the night, and now he had some brownish mucousy discharge coming out of his nostrils. I called the vet again and she came out first thing that morning with the primary vet. She tubed him again but this time we found out that the brownish discharge was his stomach contents, which meant that there was an obstruction somewhere in his small intestines that was not allowing things to pass. The pressure was so great in his stomach that the contents were being pushed out his nose. The primary vet did another rectal exam and noted that his small intestines were distended, which unfortunately isn’t a good sign. The vets gave me two options – send him to have $10,000 surgery immediately or put him down, and I had to make a decision fairly quickly. There wasn’t anything else they could do for him. The thought of having to put my horse down never entered my mind at any point in the past 15 hours, but that’s the horrible decision I was faced with at 7:30 a.m. that day. While the vets attended my horse, I went to talk to my parents, sobbing the whole time. I could not afford the surgery, and even if I did put him through the surgery, there was no guarantee that he would fully recover or not have any post-operative complications that might compromise his health in other ways. I was in total shock knowing that the only option I had was to put my beloved horse down. As I was walking him toward what would be his final resting place in the pasture next to where Sunny was buried, I couldn’t stop crying. I was trying to think of how to show him that I loved him and that I was sorry. How can I explain to his pasture buddies where he went when they whinnied for him? Would they wonder where he is? I can’t imagine how hard it must be for vets to put animals down knowing that they’re breaking someone’s heart. Cole was of course completely oblivious to what was about to happen, and as I said my final goodbye to him and told the vet to go ahead, I still could not believe this was happening. The injection is an overdose of barbiturates which ceases all brain function and breathing and induces cardiac arrest. The horse is usually unconscious before they even go down. I had never seen a horse be put down before … Sunny died in his sleep while I was away on a trail riding trip with Cole and one of my other horses. My parents had him interred before I got home so I didn’t see any of it. The procedure was quick – only about 30-60 seconds from injection to death, but the memories of that moment will live with me forever. As he went down, I went to his head and rubbed his face, sobbing uncontrollably over him. The vet said he was already unconscious, and after a few more seconds his heart stopped and then this wonderful creature’s life was gone forever. There was the usual post-mortem muscle spasms which is hard to watch because it appears that they are still alive and suffering, but then his body finally settled. Since this happened first thing in the morning, I spent most of the day (and the next couple for that matter) bawling my eyes out. Everyone said I made the right decision, but in my mind I felt like I failed him as his owner because I couldn’t do anything to help him. I thought I should have insisted the vets do more tests to make sure that there really was no other possible way to get him better. This was one of the hardest things I’ve ever had to go through. I’d never had a horse colic before, so I wasn’t aware of all the different things that cause colic. I began researching the condition as much as possible. I read several online articles, watched videos of various colic surgeries on YouTube, and purchased an extensive equine veterinary manual so I could learn as much as possible to prevent this from happening again. Perhaps there was some small sign that he showed that I just didn’t notice that could have prevented his death. How can a horse go from being normal and healthy one day to being on death’s door the next? How could an obstruction happen seemingly overnight? I know he was passing manure the night before, so what really happened? We interred him within a couple hours of his death, but in retrospect, I wish I had asked for a necropsy … even something rudimentary performed in the field just before burial. If nothing else to but to visually see what exactly was wrong with him to validate that the vet’s diagnosis was correct and that I didn’t kill my horse for nothing. It’s the not knowing what the real cause was that will haunt me the most. So far I’ve been through about half of my grief phases – shock, denial, guilt, and anger, but I haven’t quite reached the acceptance and hope part yet. I’m hoping to achieve that through writing this article and making other horse owners more aware that colic can strike anytime, anywhere, and for no obvious reason. Although most cases of colic are mild and the horse will recover in a couple days, colic is the number one cause of premature deaths in horses, so I’m only one of many hundreds or thousands of horse owners each year that have had to make the difficult decision of surgery or euthanasia. I guess the only good that’s come out of this is that it’s made me a better horseperson and made me more aware to look for any little signs that my horses show that may not seem to be significant at the time, but that little sign could prevent another horse’s unnecessary death. Having two other older horses, I know I’m going to have to deal with this again a couple more times at some point in the future. 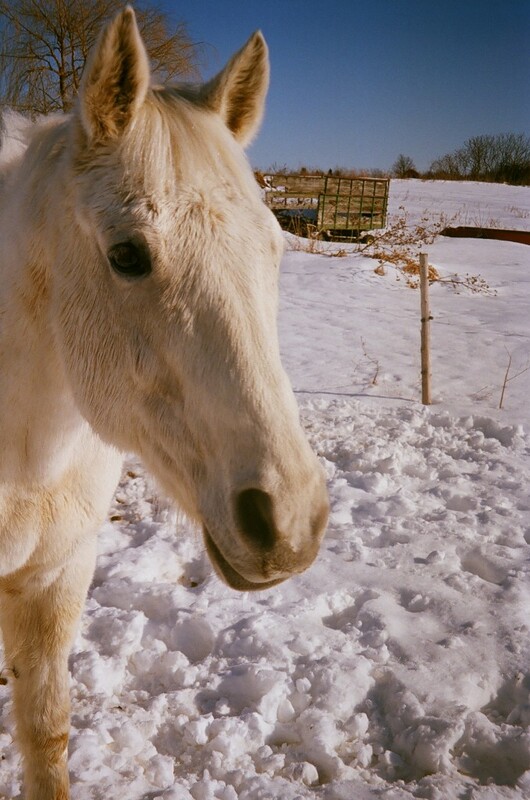 I can only hope that there is a Heaven for horses, and that someday I’ll be reunited with Cole, Sunny, and all the various pets I’ve loved and lost. We won’t know until we pass on to greener pastures ourselves. Thank you for taking the time to read Cole’s story. Love your horses, spend time with them, and enjoy every minute you have in their company. Sometimes called charley horses — particularly when they are in the calf muscles — cramps are caused by muscle spasms, involuntary contractions of one or more muscles. In addition to the foot and calf muscles, other muscles prone to spasms include the front and back of the thigh, the hands, arms, abdomen, and muscles along the rib cage. *^^..